Happy almost new year to all! I hope everyone has a happy and safe new years eve. I am looking forward to some big glasses of bubbly and lots of great food! I'd say I have a few New Years resolutions this year but the one haunt related one would be to get cracking on props as early as possible. I have a lot of ideas for Grimlock Manor this year and we are starting to add a carnival aspect to it now so I'm really going to have to work on new props that fit that theme. We want our carnival to be like a circus freakshow of sorts. Last year we started with a simple sign that read "Carnival of Souls" we had a clown carnival wheel with light up eyes (made from foam board) and a fun house blacklight maze but this year I really want to make carnival games, a freakshow tent and some creepy vending carts. I have really been inspired by The Haunt at Hellizondo, they do some amazing work with papier mache. This year they made a full merry go round with I believe it was 3-4 creatures which posed as the horses you would normally see. They did a few game stands and had a cool walk through corridor with a nice drop panel scare. Check out their website if you haven't already, very inspiring stuff. I also have a cool link I'd like to add that has to do with a pretty cool prop from Haunted Overload that we are thinking about taking a stab at. 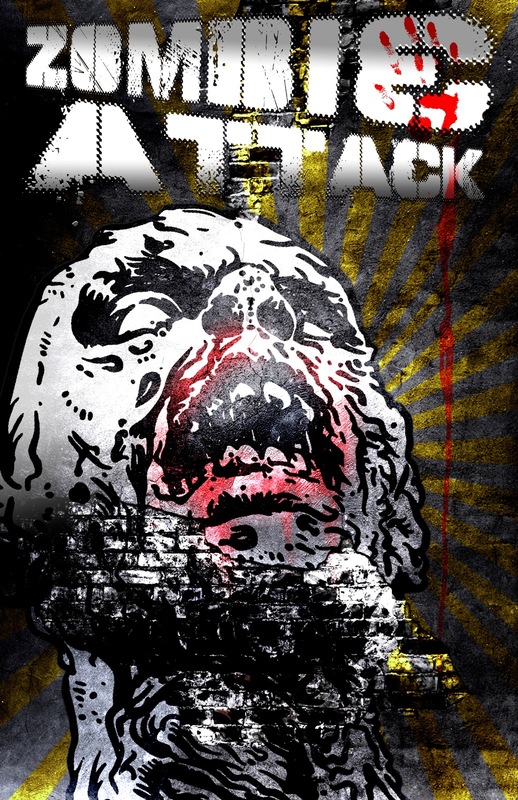 Haunted Overload is the creation of Eric Lowther. He started Haunted Overload as a home haunt and because he didn't have enough space to expand his haunt outward he decided to build up and began making these 20,40,and 50 foot creatures which are just a sight to behold. Now HAunted Overload is a pro attraction and Eric has a lot of talented people working with him one of which is Rae Enslin who made and awesome Undead Horse prop for the haunt in 2009. Rae called the horse Mr. Dead. She made a website dedicated to the step by step creation of the prop which I find to be super cool! You can see it all from concept to completion and she details everything. It is an awesome tutorial if you ever want to build an undead horse for your haunt. Check it out here at Mr. Dead Tutorial. 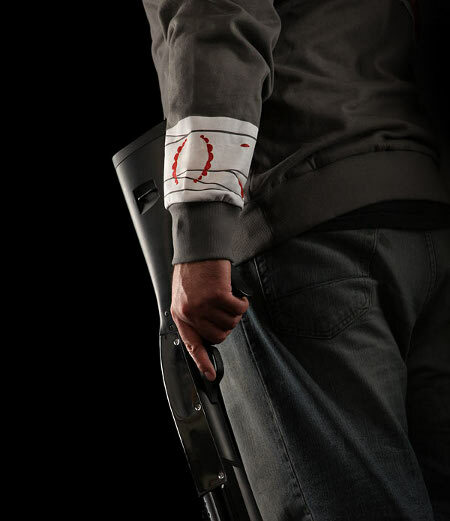 I still have props sitting that are in the works but a Mr. Dead of my very own could make the prop list for 2011. I hope to stay ahead of the game and really get cracking on things and I am looking forward to what 2011 will bring to Grimlock Manor and I hope everyone has a happy and safe new year!! So I haven't posted since the contest came to it's completion. I want to take a quick moment again to say thank you to all who entered and signed up to follow the blog! We have begun to contact everyone to send out some cool swag so be on the look out and remember to keep checking in as we intend on running more contest in the near future. The next giveaway we have in mind is a 12VDC Wiper Motor...sound good?! Just have to think up the contest now! So onto the post for today. Now I am not much of a movie reviewer. I mean I can't really do it up like my friend Johnny Thunder on Hauntcast does but I did come across what seems to be an interesting horror movie that I am not sure everyone has heard of just yet? It's called "Silent House" and it is from the same directors who brought us Open Water. The official synopsis is as follows: "A hauntingly choreographed descent into madness based on the Uruguayan film "La Casa Muda". Laura Lau adapted the script, and Lau and Kentis co-directed a cast that includes Elizaberth Olsen, Eric Sheffer Stevens, Julia Taylor Ross, Adam Trese, Haley Murphy, and Adam Barnett. The press release promises that the film is "truly a unique horror experience with immediate intimacy and unsettling terror." The most interesting thing about this film seems to be that it was only shot from one long continuous camera shot from a photo camera! That sounds crazy! I would just be interested to see how that would work out. It seems like horror flicks these days are really trying to break everything down to the bare bones and get to the core of what really scares us. It's that freaky factor over the blood and guts and gore. I've added the trailer from youtube with a few links to various write ups. If anyone else knows anything about the movie please feel free to post about it but overall I think it looks interesting especially the very last split second of the trailer when she opens the door..whooooo scaryyyyy!!! Scary Christmas to All! We Have a Winner! A HUGE Thank You goes out to everyone who entered the contest and signed up to follow the blog this month, we really appreciate it and we hope to continue to make our blog an interesting one to come visit every day. There were a lot of great answers given for the contest and we got some great laughs! It was truly hard to pick a winner but our congrats goes out to Wolfie for his Zombie Rendition of "Twas A NIght Before Christmas." Great job Wolfie!, and a great job to everyone else who entered. 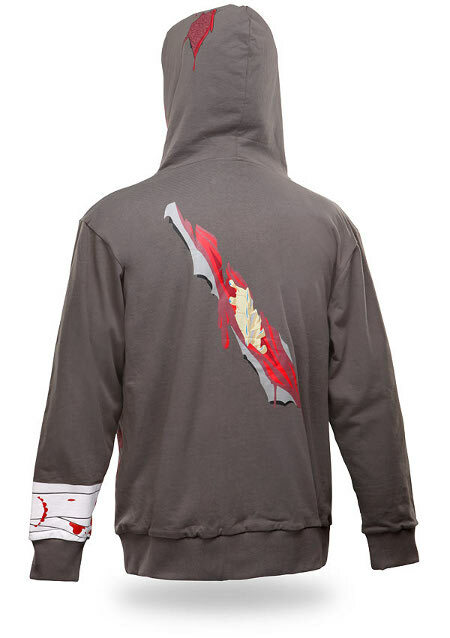 We will be contacting everyone shortly after the holiday to send out all the cool Zombie Swag! He led the shambling and broke wide the malls gates! and unleashed on the town Zombies on Skates! the zombies were faster and fresh for their cause! Now rolling undead on the lookout for brains! Remember to Enter The Contest! Tonight's post is just a reminder that you have tonight and all day tomorrow until 12 Midnight to enter the "What Would A Zombie Santa Give As A Present Contest?!" Simply go to the contest post which is a few posts below and give your answer to that question. You can give as many answers as you like. Be creative, be funny and have fun with it. I will be writing a post on Christmas Day and declaring the winner and the winning answer to the question. The winner receives a cool Framed 11x17 Canvas Original Zombie Attacks Print by yours truly and Volume 1. of A Very Zombie Christmas. Anyone else who entered or who signed up to follow the blog this month will receive some cool Zombie swag but remember, if you are signing up to follow the blog or enter the contest than please make your contact information available or I won't be able to get in touch with you and get your mailing address to send out the swag. There are a lot of really great answers and it is going to be hard to pick a winner but I am super excited that everyone is getting into it. I appreciate it and I hope to run more contest in the future as I already have some really cool prize ideas lined up SOooo...Enter to win, stay tuned and stay scary! Elaine's & The Ghosts of Cap May. Good Evening Gals and Ghouls! The question I have for you tonight is this... Do you believe in Ghosts!? Being a haunter and fan of everything Halloween and Horror related I am also naturally into the paranormal as well. Am I a believer in the afterlife? Yes. Do I go hunting for ghosts? Not really. You see as funny as it sounds that I am a haunter who loves to give a good scare and I love going to other home and pro haunts during the season to get a good scare the truth is I would probably poop my pants if I actually saw a real ghost but it doesn't stop me from kind of looking for them which brings me to Cape May and Elaine's Bed and Breakfast. The past two years my wife and I have started taking weekend trips to Cape May New Jersey and staying over night in various Bed and Breakfasts. 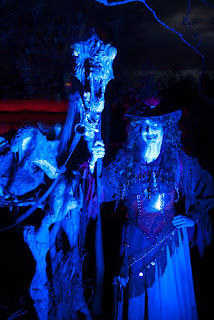 I have to say if you are a haunter and you are looking for some great inspiration especially if you do a victorian mansion style haunt than Cape May is where you want to visit! We have really grown to love the rich history of Cape May but even more than that we have really grown to be fascinated by the various haunting stories the town holds. You see back in 1878 one of the most disastrous fires that has ever swept through any seaside resort happened right in Cape May. Almost half of the town went up in ashes. So many of the buildings burned down and so many people died. It is because of this traumatic event that many believe there are still some souls who continue to wander and visit their old stomping grounds. Once such souls name is Emily and she happens to reside at Elaine's Bed & Breakfast. My wife and I were given a Gift Certificate to stay at Elaine's two summers ago. It is well known to most who visit Cape May often that Elaine's hosts a Haunted Mansion Dinner every night during the summer. Our friends who gave us the gift certificate know that I am a haunter and they figured that my wife and I would love this so we eventually booked our room and off we went not knowing that we would be staying in what was reportedly the most haunted room in the house by the book Cape May Haunts which is written by D.P. Roseberry & Psychic Laurie Hill. The setting of the evening we were to check in was something out of a horror movie. It was a torrential down pour with the loudest crashing thunder and streaking lighting I have ever seen! We almost didn't even go however, we made the trek and got there at about 9:30 PM. As I was brining in our luggage my wife Carolynn went to check in. I waited in the hallway. To my right was a small bar where I overheard a couple ask "By the way, we hear Elaine's is haunted. Is this true?" The host asked if the couple was staying at the inn and they said no so she said "oh, ok I'll tell you then. I just didn't want to scare you in case." I began to think "In case of what?" She proceeded to explain that a young girl by the named of Emily passed away in the house at the early age of 13. Her bedroom was room number 6 but she also had a play room which was room 4. Emily didn't die in the tragic fire i explained above however she was very sick. She would stay in her bedroom most of the time but go to room 4 (her playroom) when she wanted to see outside because there is a balcony that looks over the town off of room 4. Well after listening to all this you can imagine I was eager to learn what room I would be staying in for the weekend with my wife and to my shock we got room 6!! At this point my wife had no idea our room was reportedly the most haunted nor did she know much about the haunted history surrounding Elaine's or even most of Cape May for that matter but I was only learning myself. I felt I needed to tell her and of course she freaked out! There was a slight moment of dread of staying in the room but we decided to tough it out and I must say it was one of my most interesting weekends I had ever experienced. I kid you not when I tell you that throughout our stay we heard laughter, knocks coming from within our closet, children running past our room in the hallway at 3 am and what sounded like a party going on right below us in the middle of the night and the thing about all this is that besides us there was only one other couple staying in Elaine's that weekend and they were in room 4! All in all our stay at Elaine's hasn't stopped us from continually visiting Cape May and staying over and we have actually just received another gift certificate for Elaine's yet again so we will be doing a follow up there very, very soon! I highly suggest a mini vacation to Cape May if you have the chance. There are multiple ghost walk tours, night time ghost trolley tours and horse and buggy tours and so many ghostly claims to investigate while you are there not to mention some great shopping, eating and an awesome beach. For the haunters reading this, Cape May is a great trip for reference. Be sure to visit the Emlen Physick Estate if you go because the grounds and the decor of this place is simply amazing and a haunters dream! If I had the Emlen Physick Estate I don't know where I would start with my halloween display! Below are various pictures from my stay at Elaine's, my trip to the Emlen Physick house and a few links for those who are a bit more curious. I hope you enjoy and stay tuned for my future visit to Elaine's which will probably take place some time this spring/summer. I hope to do a deeper investigation and see what results I can turn up! Lunar Eclipse Time Lapse & Zombie Gear! Tell me something my friends. You ever dance with the devil in the eclipsed moonlight? Well last night was pretty cool! I didn't think I would be able to wake myself up to go outside and take a peek at the lunar eclipse but luckily I did and I was able to go outside and take a peek and man it was pretty sweet! The entire eclipse lasted probably about 2 and a half to 3 hours but I only watched for maybe 15 minutes or so until I was too cold to bare it anymore. I found some pretty cool time lapse video of the entire eclipse that I have posted below so if you missed out then check it out! As I mention..I was pretty cold standing outside but luckily I had just the right attire to keep me semi warm and that would be my "Just Been Attacked By A Zombie Hoodie!" 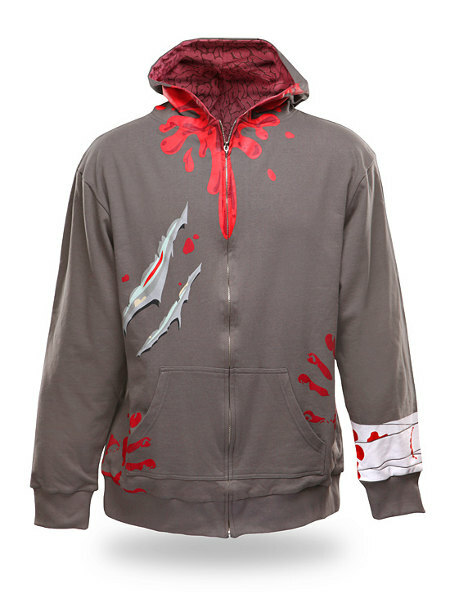 Yup you can get yourself a one of a kind Zombie Attack Hoodie at ThinkGeek.com It's a little pricy at $60 but I suppose it is better than any actual battle scars you would earn from fighting off the zombie hordes of apocalypse so go check it out. The Think Geek website itself is pretty neat and there are some other really cool Horror and Haunt related items on the site such as the Blood Bath Shower Gel, Horror Movie Shower Curtain & Bath Mat, Zombie Haiku Book and Zombie Shooting Gallery Desk Game. Well it's time to wrap up tonight's post but a quick reminder again to be sure you enter the "What Would A Zombie Santa Give as a Present" contest a few posts below. Just answer the question with any funny/creative story or one liner and have yourself a chance to win some cool swag. Also, if you simply sign up to follow the blog we here at Grimlock Manor will be sending out some cool swag in the mail. Contest ends Chritmas Eve night at 12am and the winner will be announced in the Christmas Day Blog so stay tuned and stay scary! Contest Update, Shout Outs & Lunar Eclipse! I hope all has been frightfully well! I am looking forward to Christmas and New Years to be here already. Don't get me wrong because I do love this time of year (not as much as Halloween!) but it is definitely stressful at times which I am sure you can all agree. I just want to get some free time back so I can get back to some real work on my props for the 2011 season, luckily I can still sneak in a blog post every other day or so. So on to todays news! First up is the contest update. We have about ten total entries thus far which is pretty cool considering I am still a pretty new blog. I absolutely appreciate everyone who has entered thus far and I encourage anyone who hasn't to please not be shy and throw up a post. 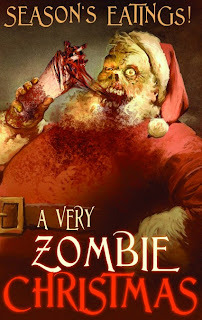 Just answer the question "What would a Zombie Santa give as a Christmas Present?" 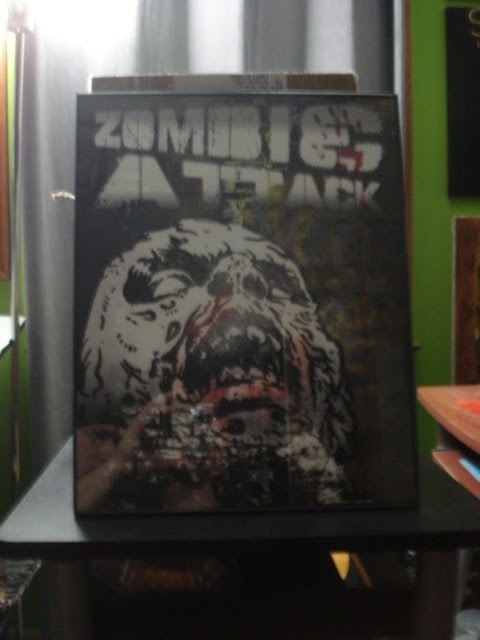 Just be creative and have fun with it and who knows maybe you will win the 11x17 Zombie Attacks poster and Vol. 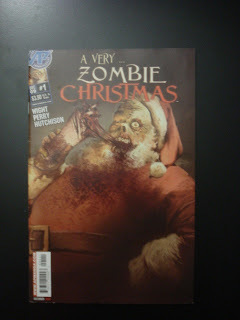 1 of "A Very Zombie Christmas!" I've posted actual pictures of the items below all ready to go out to the winner who we will announce on Christmas Day! The Zombie poster is in a nice glass frame ready to hang in your home or work office, man cave, evil dungeon or dragons lair and the comic is all ready to be a permanent fixture on the side of your porcelain throne! Also, be sure to sign up to follow the blog because even if you don't win the grand prize I will be mailing out some zombie swag to all who sign up to follow so getch ya some Grimlock Manor Zombie swag and sign up today! Next up I want to give a shout out to some Vloggers and Bloggers out there real quick. I've only just begun home haunting in the last three years so I am playing catch up with a lot of the great haunt blogs, vlogs and websites out there. I can't post them all but there are a few recently that I've gotten really into that I just want to note in case you haven't heard of them yourself and hey if you know of any or have one yourself that you want me to check out please let me know because I am sure in the future I will do some some more in depth write ups on these and others SOOoo...recently I have really been into Steve's Haunted Yard, Steve gave us a shout out in his most recent blog which was super cool so please check him out Here and at his website Forgotten Cemetary. Also I am sure you all know Johnny Thunder who gives us those awesome horror reviews on Hauntcast well he has a really cool blog called the Midnite Spookfrolic. It is such a great read and he keeps it updated regularly. Speaking of Hauntcast I love, love, LOVE this podcast. There are a lot of podcasts out there that come and go that talk about halloween related topics but Hauntcast is really all about us home haunters. I've written about it before but please support Chris Baker The G-Host with the most and his whole cast of minions over at Hauntcast. Finally there is the Bloodshed Brothers. The brothers blood do a Vlog (video blog ) almost ever day. During Halloween they are hard at work on their home haunt and in the off season they will still try and throw in some hallowen related news but they also do movie reviews and have even started with some haunt product reviews but whatever the topic is you can rest assure it's always a good vlog. Wow! This is a long post ok so to finish it all up if you didn't know tonight is a Lunar Eclipse which only takes place when the sun, earth and moon are all perfectly aligned. This is a pretty amazing event seeing how the last Lunar eclipse was 371 years ago! Unlike a solar eclipse which only can be seen for a few moments a lunar eclipse can be viewed for several hours and you won't require any special glasses or equipment like you would with a solar eclipse because a lunar eclipse is perfectly safe to view with just your eyes. So if you feel like take a look at one of the earths most amazing event's then keep your eyes peeled between the hours of 1:30am & 5am. Should be cool! Alrighty then! Remember to post your answers to the "What would a Zombie Santa give as a Christmas Present?" contest in its' post which is two below this one and sign up to follow the blog for some free swag! Stay Scary! Contest & Home Haunt Of The Year Finalists. A Frightfully Scary hello to everyone today! Just some updates today. The "What would a Zombie Santa Give as a Present" contest is still running. We have a few entries so far and there are some pretty funny answers so please check it out in the post below. All you have to do is answer that question with a creative answer in that post and Bingo Bango Boingo! 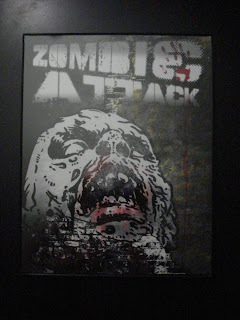 your entered to win an 11x17 canvas Zombie Attacks poster that is nicely framed along with Vol. 1 of a Very Zombie Christmas! The contest will run until Christmas Day when we will announce the winner in our Christmas Day post along with their creative answer. You can enter as many times with as many answers as you want. I will be picking the winner with the help of a few family members and friends but essentially everyone will be a winner because as long as you enter and sign up to follow the blog I will be sending out some cool Zombie Swag to everyone who that signs up as a follower so remember to sign up and have some fun with your answers! Next update is about the Home Haunt of the Year Contest brought to us by the Home Haunters Association. There was about 50 entries this year and they were all awesome. So many pictures and videos, I can't imagine how hard it was to judge. Grimlock Manor Submitted a video but unfortunately we didn't make the cut this year but that is ok because it gives us the drive to continually perfect our craft and strive to continually make our haunt the best it can be. I've posted the first round finalists below and a link to the HHA website so you can view all the videos and pictures. I encourage everyone to take some time to head on over there and take a peek at all the hard work these home haunters put into their haunts. As a home haunter myself I know we put in endless hours working on our haunts every year, some of us work all year round on them so I tip my hat to everyone who continually strives to put on a great show and give Halloween the respect it's due and thank you to the HHA for running such a cool contest for us Home Haunters to participate in. Also, a quick shout out to Steve's Haunted Yard for making the first round cut's! Steve was the first entry into the "What would a Zombie Santa Give as a Present"contest and I want to wish him some good luck in the running for Home Haunt of the Year! Stay Scary everyone, remember to take a few minutes and enter the contest in the post below and please support the awesome home haunters of the world and check out the HHA Website below! Zombie Terrors!!! & Zombie Santa Contest! Good Evening One & Everyone! I figured I would start with a greeting that had a little more kick than just "hi all" or something along those lines, so what did ya think haha! Well I wasn't sure I was going to put a new post up until a few days from now but today I was sitting at my desk at work looking at this 11x17 zombie poster that I got for free at my local comic shop down the block from were where I work in New York. I got the poster a few weeks before Halloween and it is a poster that is advertising a new Graphic Novel called Zombie Terrors! I usually go to my local comic shop on Wednesday's which is new comic book day for those none comic book readers out there. I kept forgetting to check out what the Zombie Terrors comic was all about and finally after starring at the poster yet again today at my desk I figured I would head down to the shop to finally check it out seeing how it has been out since Halloween day. Needless to say I was pleased with it. I mean how can you go wrong with zombies right? Arrrrrggg! Brains!!! Next up on my Zombie Comic list is "A Very Zombie Christmas." I saw it today while in the shop and figured with the holidays right around the corner I can't go wrong with this one but answer me this "what kind of presents would a zombie santa give out anyway?" Now don't just say BRAINS!! 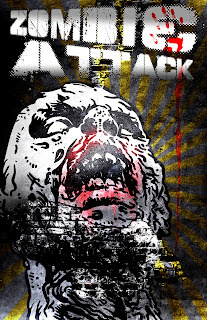 ...but read carefully here...if you do answer with a creative answer in this post I am going to be giving away a cool one of a kind Zombie Attack Poster created by yours truly (see poster below) and a copy of A Very Zombie Christmas Vol 1. The contest ends Christmas Day and we will post the winner right here on the blog SOOOooo...What kind of present would a Zombie Santa give? Your Answer here_____. Be creative, most creative answer wins! Please keep your answers nice and not too naughty! The Comic You Can Win! The Poster You Can Win! Been a few days since my last post and really it's because I am slacking with the two props I am in the process of working on but with Christmas right around the corner it's been a little hard to get anything done so there might not be any prop updates till after the holidays however!... I do want to highlight a prop of mine that I have had for the last two years that I really like called the "Hollow Face Illusion." Most home and pro haunters out there are probably familiar with this illusion so this is nothing new but it is one of my all time favorites! If you have ever been to the Haunted Mansion at Disney then you have seen this illusion at work. Basically the Hollow Face Illusion is an optical illusion in which the perception of a concave mask of a face appears as a normal convex face. A hollow face can appear to move its eyes faster than the viewer: looking forward when the viewer is directly ahead, but looking at an extreme angle when the viewer is only at a moderate angle. All in all the face appears to follow you as you walk by it. I think this is such a great effect and if it is lit properly and in the right setting you will have a lot of people doing double takes. 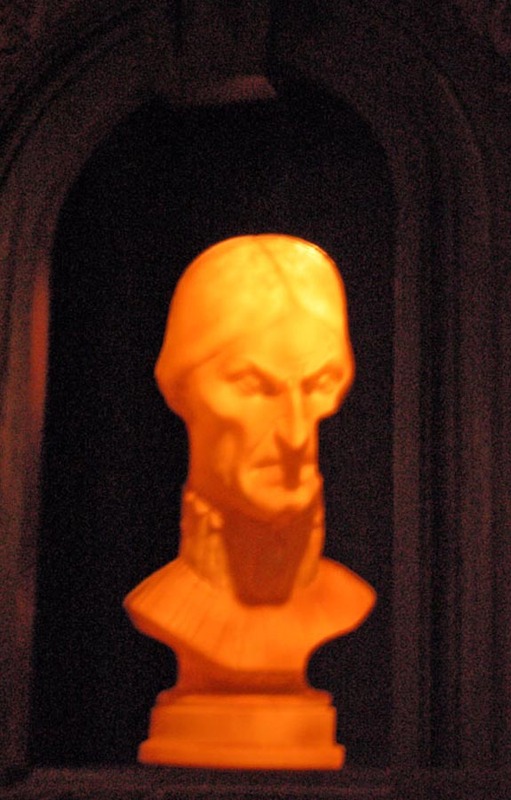 Below are a few pictures from the original hollow face illusions from the Disney Haunted Mansion ride as well as the two CG versions that appeared in the Eddie Murphy movie The Haunted Mansion. I have also created a quick video of my hallow face illusion from my haunt. I have two of these guys a male and female bust but only shot the one, I think you will get the idea. I hope you enjoy and please stay tuned in. Lot's of new stuff brewing for the new year so hopefully after the holidays we can really get to the good stuff! I'm on a slight animated video kick recently. I love all the old school 80's cartoons like He-Man, Thundercats, G.I. Joe, Transformers (and on, and on!) I also really love stop motion animation and 3D animated flicks. I'm a HUGE Tim Burton fan (who isn't) and absolutely LOVE The Nightmare Before Christmas, I even had a Nightmare Before Christmas themed wedding! With all that said, I'm always on the look out for some unique short films I've never heard of or a cool stop motion or CG film and if it has a spooky vibe to it then that's even better. In my last post I wrote about the stop motion series "What It's Like Being Alone." If anyone has taken a few minutes to watch any of the series I would love to see some comments in the post for the series to see what you thought about it. Today I am writing about a short CG animated film called Spring Heeled Jack. I don't have much info on the film other than it was created by Geof Wolfenden. I do know a little something about the actual character however! Spring Heeled Jack is a character from English folklore said to have existed during the Victorian era and able to jump extraordinarily high. 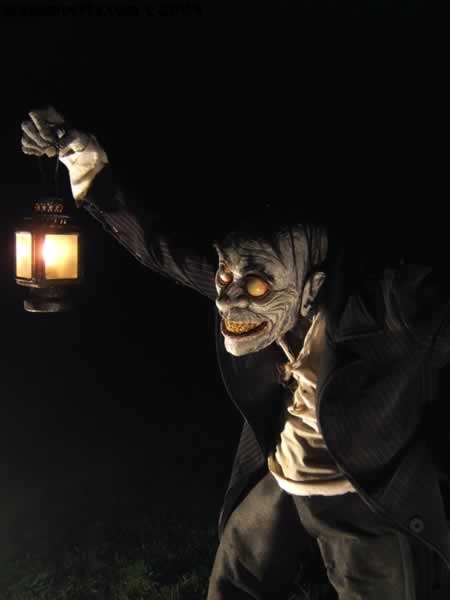 SH Jack was described by people claiming to have seen him as having a terrifying and frightful appearance, with clawed hands and eyes that resembled red balls of fire! You can actually read more about SH Jack on Wikipedia if your interested in a more in depth look at the character. This short film seems to show off the character os SH Jack just as explained above. It's a fun concept for a film and I think it's a unique character concept. The CG isn't spectacular but the narrator does a great job with the story and the soundtrack gives it that little something extra. Overall I felt it was a fun little short film with a christmasy/halloween-ish feel too it that I hope you will enjoy! Please feel free to let me know what you thought! Spring Heeled Jack from Geof Wolfenden on Vimeo. I'm currently continuing my work on my new paper mache prop today and hope to have some progress pictures by Sunday night or mid week next week but I wanted to get a post in here today. I do have some exciting news to share soon but it will probably be another week or so before I can really share so please stay tuned because it will be a fun and interesting addition to this blog for sure! Todays post is about a stop motion series I came upon maybe a year or two ago that I was just thinking about the other day and because it has some freak show type Halloween-ish type characters so I figured it was fitting for the blog and maybe most of my haunt readers out there might like it. The series is called What It's Like Being Alone and was featured on CBC Canada back in 2006. It's a dark comedy claymation series aimed at adults. There are 13 episodes (one season.) The storyline follows a groups of mutant children living in an orphanage. • Armie, a boy with no limbs, except for his left arm. He glides around on a skateboard. • Brian Brian, an incredibly intelligent 9 year old boy with two brains and three eyes. • Byron & Beasly, a blue baby with two heads. • Charlie, a flaming boy. • Princess Lucy, a short, fat, warty grey blob of a girl who believes she is a princess. • Sammy Fishboy, a swamp monster. • Seymore Talkless, an eleven year old boy with no mouth and one eye. I'm back with part two of my Working on Props posts. In the first round I began to modify a plastic skull with an LED Eye Kit from Hauntbots. My goal is to continue to work on that skull, repaint and corpse it and hopefully add it to a body but tonight I started working with a material that is new to me called Claycrete. Essentially I would say that Claycrete is just like papier mache pulp that you would make at home by blending your paper into a fine pulp than adding in your flour and water, glue and water or whatever mix works best for you. In the case of Claycrete the mache is already made for you and all you need to add to it is the water. I don't really have a clear idea in mind for this prop yet but I know I want it to be one of the creepy characters at my Carnival of Souls haunt next year. I suppose the inspiration for this prop would be Deadspiders Mr. Hemlock Dench prop that you can read more about on her website AranaMuerta.com. Instead of using a skull or foam head as a base I built up a large paper mache ball to work off of. When the paper had dried I began to apply the Claycrete mixture to the paper mache ball. The wet Claycrete did soften the paper mache base slightly but not to the point where I had to scratch the idea and start with a different base. I only focused on the the front portion where the face will be because I intend on adding hair of some sort and possibly a top hat in the end. Right now I am in a very rough state but have attached ping pong balls for the eyes and quickly formed out a nose and some eyebrows just as guide. Another round of Claycrete is up next. I hope to define his face more, add a mouth and fill in around the eyes more. Once the face is done I will need to spend some time sanding it down to smooth it out and then it will be time for paint. I hope to have a new round of pictures next week to show you the progress I have made. It's surely and experiment using a new product but it's a fun one that I hope turns out good! Stay tuned! 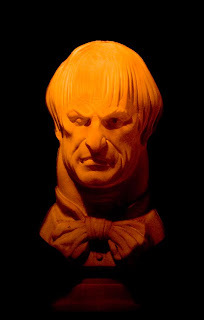 Here is Mr. hemlock Dench who I think is awesome! He is the inspiration behind this prop. This is a close up of the beginning stages of Mr. Denche's face. When I saw this I decided Claycrete might be a good material to try and see if I can get the same results. This is the Claycrete as packaged in the store. It is a fine paper pulp that dries super hard! I started by making a solid paper mache ball and once dry I began to add the Claycrete to form a face. Once I had the front covered with the Claycrete I added ping pong balls for the eyes applying them with Gorilla Glue. I then formed a quick nose and eyebrows as guidelines for when I begin to detail the face. I'll continue to add more Claycrete to form the face and begin really defining facial details. Once satisfied I will sand until smooth and then start the paint.